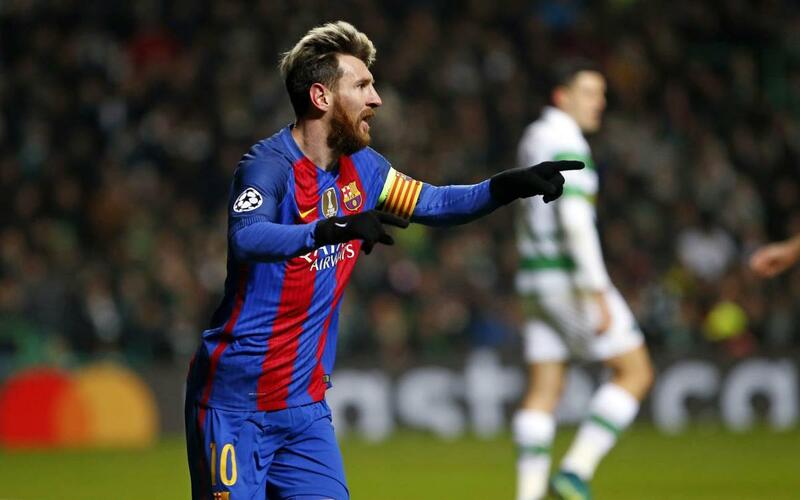 Celtic FC 0-2 FC Barcelona: Group C champions! FC Barcelona have won 2-0 at Celtic Park. And not only does that send them through to the knockout stages of the Champions league for the thirteenth time in a row, but Manchester City’s 1-1 draw in Monchengladbach means the Catalans are already guaranteed one of the eight seeded berths. All that with one game to spare, so we won’t be finding out who Barça will be meeting next until the draw on December 12. It was an effective and workmanlike performance that got the job done in Glasgow, and once again it was Leo Messi who took centre stage, scoring a cracker after 25 minutes and adding a penalty in the second half. The result brought an end to European football at Parkhead this season, but not even that could silence the home fans. That, it would seem, is something that not even Messi can do! This game was always going to be fun. It had the home supporters belting out their impressive repertoire of songs, Barça responding with their full repertoire of fancy football and the famous hoops playing with the kind of intensity that they were so severely lacking when they lost 7-0 at the Camp Nou two months ago. It meant that although the Catalans were governing the game, all they got out of the first 25 minutes were two or three half chances for Messi. All the same, the only real question seemed to be how long the Celts would be able to hold out. And when the goal finally came, it was well worth the wait. Neymar Jr’s lofted chip to Messi was simply sensational, and the casual way that the Argentinian slipped the ball in between Celtic keeper Craig Gordon and his post was no less impressive – and that was his 100th goal in international competition. Few cities are as football-savvy as Glasgow, and no matter how much that goal hurt the green-and-white-clad thousands, few could have denied that they had just witnessed a moment of magic. Before the half was over, Gordon treated the Celtic faithful to some magic of the local variety with a superb one-handed save to prevent Luis Suárez from extending on that lead. Barça were on top, but Celtic were still in the game at half-time, the best of their own chances being a Dembele effort from close range that required a bit of the best from Ter Stegen. The news from Monchengladbach was not helping the Celtic cause, for as things stood they weren’t even getting the consolation of a Europa League slot. There was certainly a new verve to their football after the interval, but just when things looked to be swinging the Scottish way, Izaguirre clambered over Luis Suárez in his own area, the Italian referee rightly decided it was a penalty, and from the spot Messi tucked away his 9th Champions League goal of the season. That looked enough to put this game to bed, which did indeed prove to be the case. Barça had things well under control and although the noise on the terraces was as incessant as ever, there was not an awful lot for the home fans to get excited about on the pitch. The final third of the match was also the most tepid – the closest chance coming after 84 minutes when Luis Suárez's shot clipped the wrong side of the post following a dizzying piece of skill from Messi, while Luis Enrique also opted to send on Marlon Santos for his first official appearance in the first team shirt. But by that stage, there was little doubt where the three points from this game would be going. And they’re three points that mean that Barça are one step closer to a trip to Cardiff!